Phuket (Thailand) – February 8, 2019 (travelindex.com) – The Naka Island, a Luxury Collection Resort & Spa, Phuket awarded “Gold Level” Green Hotel Award at the 12th Anniversary G-Green award ceremony organized by Thailand’s Department of Environmental Quality Promotion, Ministry of Natural Resources and Environment. This prestigious award strengthen the resort’s sustainability and environmental policy in Thailand. The event was attended by government and industry leaders, hotels and hospitality organizations, international print and broadcast and is highly regarded among the global travel and tourism communities. Aimed to raise awareness on natural resources conservation, to promote people’s participation in environmental protection and to honor role-model individuals and organizations, the Green Hotel Award also celebrates its 12th Anniversary this year. A total of 221 awards were given to organizations, hotels in Thailand ranging from small to large and general to specialty. “Receiving this green-focused award means a lot to us and this also drives our resort’s sustainability and eco-consciousness. While travelers are looking more for to ensure their personal commitments to living more sustainably, we then aim to set the new benchmark for Phuket’s green initiative and to be the resort of choice to ensure memorable stays yet eco-friendly.,” said Mr Erich Friedl, General Manager of The Naka Island, a Luxury Collection Resort & Spa, Phuket. 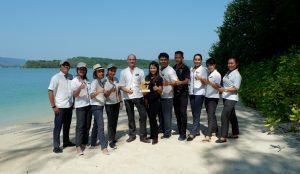 “Our commitment to environmental issue counts and in line with our resort’s corporate responsibility policy to reduce environmental impact, our proactive associates are aware of this matter well and they’re very active on participating environmental events with local community to ensure that our ongoing green initiatives are making waves not only in Phuket but Thailand and the whole world.” He added. Apart from removing plastic straws initiative, The Naka Island, a Luxury Collection Resort & Spa, Phuket’s Green Committees also works hard to enhance the sustainability of the operations, to reduce both plastic consumption, and to reuse/recycle things where possible. According to Department of Environmental Quality Promotion, Ministry of Natural Resources and Environment, Green Hotel award is graded by industry experts and honorary judges and is divided into 3 tiers includes bronze level (Score of 60-69% or above), silver level (Score of 70-79% or above) and gold level (Score of 80% or above). Among 6 hotels in Phuket and 23 hotels nationwide, The Naka Island, a Luxury Collection Resort & Spa, Phuket won “Gold Level” Green Hotel Award 2019. Nestled among stunning beaches, lush coconut groves, with never-ending views of the emerald-green Phang Nga Bay and idyllic landscapes of the Phuket coastline, The Naka Island is an exclusive boutique resort on Naka Yai Island, located just off the Phuket coast. Only 25 minutes from Phuket International Airport and short distances to famous tourist attractions, The Naka Island is accessible only by a short speedboat journey, making it a uniquely private and intimate retreat. Book your Marriott hotel in Phuket, Thailand and around the world in 99 countries at best rates available. Pay at the hotel and earn HolidayClicks Points. Book now at HotelWorlds.com! The Luxury Collection, part of Marriott International, Inc., is comprised of world-renowned hotels and resorts offering unique, authentic experiences that evoke lasting, treasured memories. For the global explorer, The Luxury Collection offers a gateway to the world’s most exciting and desirable destinations. Each hotel and resort is a unique and cherished expression of its location; a portal to the destination’s indigenous charms and treasures. Originated in 1906 under the CIGA® brand as a collection of Europe’s most celebrated and iconic properties, today The Luxury Collection brand is a glittering ensemble, recently surpassing 100 of the world’s finest hotels and resorts in more than 30 countries and territories. All of these hotels, many of them centuries old, are internationally recognized as being among the world’s finest. The Luxury Collection is proud to participate in the company’s award-winning loyalty programs – Marriott Rewards®, The Ritz-Carlton Rewards®, and Starwood Preferred Guest® (SPG). The programs, operating under one set of unparalleled benefits, enable members to earn points toward free hotel stays, achieve Elite status faster than ever, and seamlessly book or redeem points for stays throughout our loyalty portfolio of 29 brands and more than 6,700 participating hotels in 130 countries & territories. Marriott International, Inc. (NASDAQ: MAR) is based in Bethesda, Maryland, USA, and encompasses a portfolio of more than 6,700 properties in 30 leading hotel brands spanning 129 countries and territories. Marriott operates and franchises hotels and licenses vacation ownership resorts all around the world. The company also operates award-winning loyalty programs: Marriott Rewards®, which includes The Ritz-Carlton Rewards®, and Starwood Preferred Guest.